Aw, I love Marlo Thomas. She had the world's most awesomest flip hairdo in "That Girl," and she brought the world "Free to Be ... You and Me," one of the coolest books (and records, and TV specials) of my childhood. It seems kinda weird to look back now and think that people really needed "Free to Be..." to tell them what seem like totally obvious things, like that boys can play with dolls, and girls can bait hooks, and no one outside those goony women in soap commercials actually enjoy doing housework. 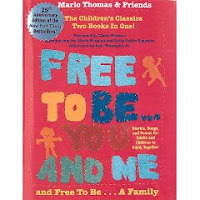 But times were different then, and "Free to Be..." helped bring us a little closer to the ideal espoused in its pages. Marlo Thomas is writing a memoir now, and I'd like to read it, because she seems kind of awesome. Watch the video on this story where she talked about "Free to Be..." and see if you don't love her, too. The video also shows some comparison shots of pages in the original version of "Free to Be..." and the 2008 35th anniversary edition. The wonderful ragged notes passed in "The Southpaw" were replaced by texting, and I don't like the new book cover as much, but I guess they wanted to appeal to modern kids. The embedded clip, "William Wants a Doll," is the song I most remember. Yes, that's Alan "Hawkeye Pierce" Alda singing. Not a bad voice! Here's a link to the classic title tune.